Sponsored Post: Do You Ever Feel Like Having a Big Az Sandwich? Many moons ago, I used to work as a bouncer at a bar in Boston, MA during my college years. Often, I’d get out of work in the wee morning hours between 2:30 AM and 3:30 AM. On my way home, my only companion was a ravenous hunger that demanded attention. In those moments, I had two choices to either go home on an empty stomach and try to make it to morning or to get something to eat from the only place still open – a convenience store. Over the course of many late night shifts, I ended up trying a variety of foods from the convenience store on my way home. I tried bags of chips, processed meat sticks, taquitos from the eternally rotating heated rollers, and even wrapped microwavable sandwiches. The one common denominator was that while feeling gross about myself was a given, I never felt satisfyingly full from any of the many, many late night snacks I tried. That’s where Big Az Burgers comes in. When a representative for Big Az Burgers contacted me to give their burgers a try, I had an immediate sense of morbid nostalgia for those late night convenience store runs, so I agreed to try their product. They sent me a generous quantity of three different sandwiches carried by convenience stores across America. Each of them were huge, unfrozen, and surprisingly hefty. Just holding one, I knew that these sandwiches would fill me up. 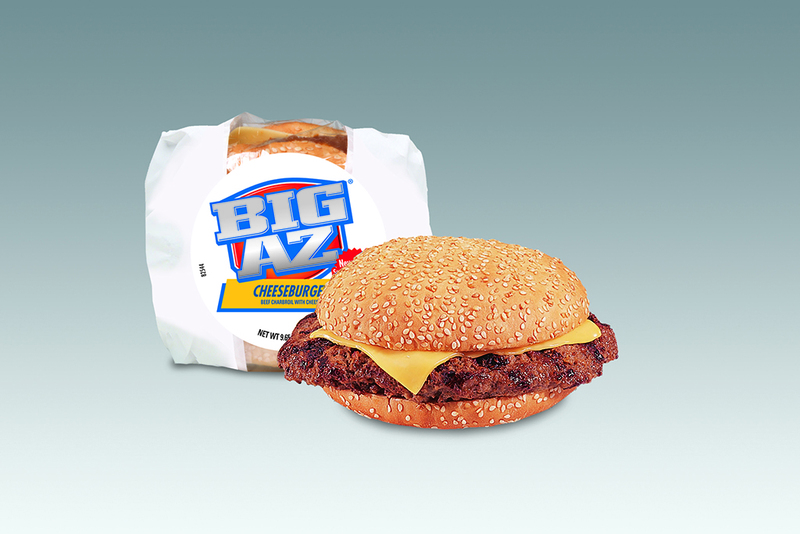 You can learn even more about Big Az burgers by clicking here: www.advancepierrepromos.com. As I said, Big Az sandwiches aren’t frozen at the convenience store, which is already a step in the right direction when it comes to most prepared foods. They are found in either the refrigerated section or near the hot prepared foods. All it takes is 1.5 minutes in a microwave and the sandwich is ready to eat! If you’re interested in finding a location that sells Big Az sandwiches check out the BIGAZ Facebook Page. The three sandwiches I got to try were their standard cheeseburger, their jalapeno cheeseburger, and a chicken patty sandwich. The first thing I noticed was the size of the sandwiches. The burgers were both “whoppingly” the same size as a certain fast food royalty’s signature burger. The chicken patty sandwich was somehow even bigger! Big Az Cheeseburger – Upon opening the packages of burgers I knew that I immediately wanted to try the Cheeseburger because it’s the base model of the Big Az sandwich line. The first thing I noticed was the size, which is pretty big as far as fast food style burgers go. The second thing I noticed was the heft. This bad boy was heavy! After heating up the burger in the microwave for 1.5 minutes, I unwrapped a steaming, tender burger. The bread wasn’t dry or tough as it sometimes can get in a microwave, but it was soft and a little spongy. The sandwich also contains a decent amount of cheese, which I could see melting around the sides of the sandwich. The meat itself was tender, but didn’t taste like a typical burger. The texture and flavor of the meat for me was more like meatloaf than a usual burger. Big Az Kickin’ Jalapeño Burger – After the cheeseburger, I moved on to the jalapeño burger. It has the same basic size and weight of the cheeseburger, but it contained white American Cheese instead of yellow, which I often prefer. I also could smell a light hint of the jalapeños even through the wrapper! When I heated it up and opened the package, I smelled the wonderful aroma of spicy peppers. I wondered if the sandwich would actually be too spicy, but while the burger does have some nice heat, it’s not overpowering. Due to the spicy flavor of the peppers and white American cheese, I think I would have to give a slight edge to the kickin’ jalapeño burger over the regular cheeseburger. Big Az Country Fried Chicken Sandwich – Last, but definitely not least, I tried the chicken patty sandwich with cheese. The chicken patty is so big that it hangs off the bun, which is kind of great. This sandwich reminded me of grade school lunches where chicken patties made their way onto hot lunch plates across the U.S. The big kid in me was excited to try it. Nonetheless, anytime something breaded is placed in the microwave, there’s almost always a potential issue with crispiness. After heating, the chicken sandwich isn’t immediately very crispy, but if left to cool a little, it does regain a little bit of crispiness in the breading. There isn’t as much cheese on the chicken sandwich as on the burgers, but that’s fine with me. On its own, the sandwich is reminiscent of the chicken patty sandwiches of my youth except much, much larger. This sandwich is extremely filling. Between the three sandwiches, I think the country fried chicken was my favorite. All of the Big Az sandwiches come without any condiments, so you can eat them as they are or add your favorite condiments. I highly suggest adding a little lettuce and mayo to the chicken sandwich. On the burgers, I added some ketchup, mayo, lettuce, and thin sliced onions to make a huge burger even bigger. If you can dress up the sandwich with your favorite condiments it’s worth doing that, but you can also eat the sandwiches as they are. At the end of the day, these big sandwiches are super filling either way. If I had one of these late at night after bouncing at the bar, I would have waddled home completely stuffed. If you’re really hungry for a sandwich and need something quick or on the go, then maybe a Big Az sandwich is for you. You can even stock up on them because they’ll keep in the fridge for about two weeks or in the freezer for a year! This is a sponsored blog; while the views expressed here were genuinely mine, consideration was paid to me by AdvancePierre and BIGAZ Burgers to review this product. Copyright © 2016 Man Fuel Food Blog. All Rights Reserved. The content on this page is owned and written by Man Fuel Food Blog (www.manfuelblog.com). Some of the photos on the page are owned by Advance Pierre/BigAz Burgers, but used here with express permission. Duplication or use of any of this content without permission is prohibited. The presence of this content on any site other than Man Fuel Food Blog is a violation of this Copyright. For permission requests to use some or all of this content, use the contact form in the “About” section.